The Video Flex® Explorer will meet all your needs without exceeding your budget. It’s the ideal solution when seeking portability and versatility. 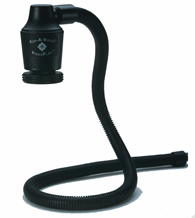 The 40-inch neck can be coiled into a base for microscope applications, or can be wrapped around a telescope, object, or person to provide a unique point of view. Great for use in classroom activities involving microscopes, telescopes, distance learning, and computer-based multi-media programs. Simply coil the 40" flexible neck to stand on its own or wrap it around an object and shoot precision video from any angle. Focus on objects up close or to infinity with a 1/4 turn of the lens. Comes complete with an 8 mm lens, a 28 mm and 34.5 mm built-in microscope eyepiece adapters, AC adapter, and an instruction manual. Connection to a TV monitor, VCR, video projector, or computer requires that these units have a “Video In” port. If connecting to a TV set without a “Video In” port, an RF modulator (not included) or a VCR (not included) is needed. A USB adapter (sold separately) is also available for use with computers with USB ports. Lens: 8 mm. Sensitivity: 2.0 lux. Resolution: 450 lines, 542 x 496 pixels. Magnification: 50:1 (or greater). TV system: NTSC/PAL. Output signal: Composite. Power: AC adapter (included). Ken A Vision Video Flex 2100 Explorer. • No Base required = "Baseless"
• Magnification: 50:1 and Greater. Custom Non- Returnable. 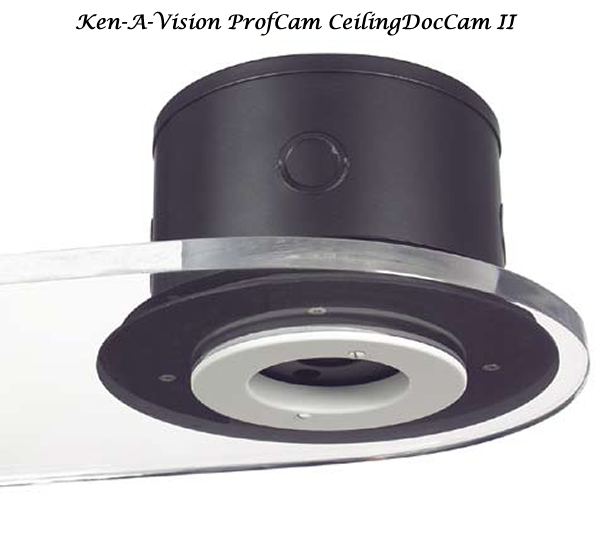 Ken-A-Vision Video Flex 7200UM COB 1/3" CMOS MegaPixel Presentation Camera, USB 2.0: The perfect tool for capturing images and storing them on your computer’s hard drive or sharing them with the class live on a computer screen or LCD projector. 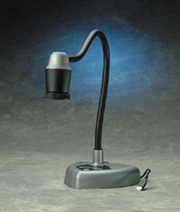 It can be used alone to view large specimens, with the included Discovery Scope Kit to view small specimens, or with a microscope to view microscopic specimens. The 7200UM is a high-resolution 1/3" CMOS presenter designed to be used as a classroom or lecture camera. The 7200UM has a flexible goose neck and outputs video via a dedicated USB connector. The camera integrates a lens that can be used to display text, flat-art or 3-dimensional items onto computer monitors or through data projectors. It can even be attached to a microscope! This presenter produces high-quality images, providing exceptional benefits for the classroom and beyond. The Video Flex 7200UM plugs directly into any USB-equipped computer. 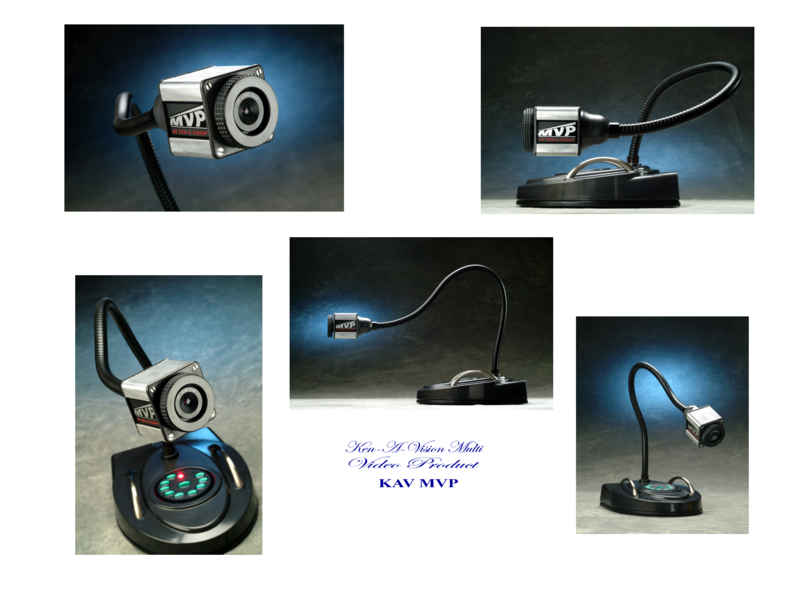 The USB allows image output and also provides power to the camera. Objects, flat art and text can be displayed clearly on monitors or data projectors. The 7200UM outputs up to 30 frames per second and comes ready with Applied VisionTM software for easy manipulation of images and movies. The 7200UM outputs at 1280 x 960, making it perfect for high-resolution imaging including viewing scientific specimens and small objects. The 30" goose-neck allows the camera to be aimed at almost anything, from tabletop text to wall-mounted maps or even the lecturer themselves. The 7200UM is built from polycarbonate material, making it very durable yet extremely lightweight. Whatever the environment, the camera is up to the task. The discovery scope kit is included, allowing users to view specimens without the need of an external microscope.